View more photos from the Focused Topic Meeting on the SETAC Flickr account. Environmental risk assessment (ERA) relies on data and models to assess the likelihood that adverse effects to humans or ecosystems may occur as a result of exposure to one or more stressors. Unfortunately, the ability to provide timely and cost effective risk assessment for many chemicals is limited by a lack of available toxicity data for a vast majority of compounds. In an effort to address this challenge, the chemical safety assessment community has been taking advantage of advances in biology and biotechnology to make increased and more effective use of in vitro and small scale in vivo methods to facilitate high-throughput screening (HTS) approaches that can help inform ERA. 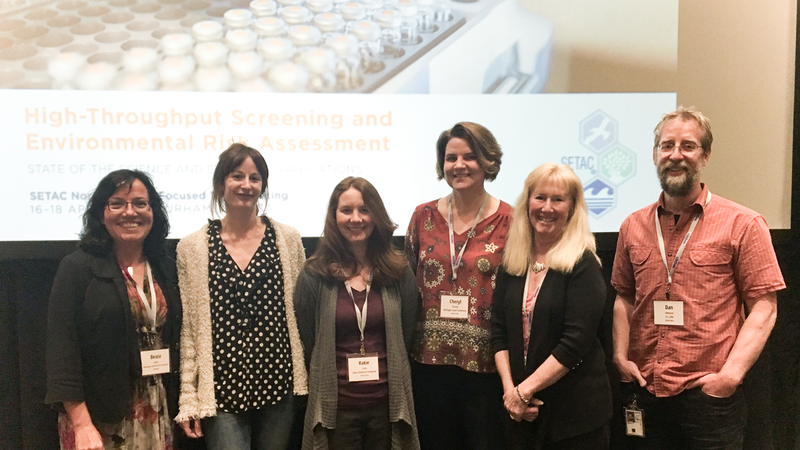 To address this topic, SETAC North America held a Focused Topic Meeting titled “High Throughput Screening and Environmental Risk Assessment: State of the Science and Emerging Applications” from 16–18 April 2018 in Durham, North Carolina. The meeting gathered 112 participants from around the globe to showcase the state-of-the-science of HTS applied in ERA. 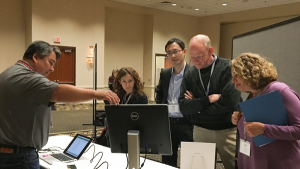 The meeting included a series of plenary and poster presentations, hands-on tools demonstrations, an expert panel and concluded with a plenary roundtable discussion. Organizers also developed interactive story problems and encouraged the engagement of participants to learn more about the topic. The meeting started with an overview of the ERA framework as well as some approaches for incorporating HTS in ERA. Nicole Kleinstreuer, Deputy Director of US National Toxicology Program’s Interagency Center for Evaluation of Alternative Toxicological Methods (NICEATM), and Rusty Thomas, Director of the U.S. Environmental Protection Agency (EPA) National Center for Computational Toxicology (NCCT), provided overviews of a national strategy to modernize chemical safety testing and a path toward accelerating development and use of HTS data in regulatory risk assessment. Additionally, the power of modern computing and data science for enhancing data collection from the peer-reviewed literature and for inferring hazards from chemical structure was discussed. The panel was aware of the volume of HTS data being generated, yet noted that HTS data is currently not being widely used in ERA. The panel saw opportunity for near-term application of HTS in chemical screening, read across and extrapolation and design of intelligent testing strategies among other areas. Panel members agreed that HTS data may be applicable in prospective environmental threshold and benchmark identification (e.g., water quality criteria and effluent discharge limits for permits) and retrospective ERA of contaminated areas after methods mature further. The panel clearly saw the potential uses of HTS data in ERA, especially in the context of chemical mixtures. Panel members concurred that case studies are needed to build familiarity and confidence in the application of HTS data before regulatory acceptance is likely. The panel members and audience put together a list of benefits for using HTS. The resulting list of potential opportunities and benefits was longer than the list of challenges. The first day ended with the presentation of three “story problems” to participants. The story problems were based on the following scenarios: Replacements for a chemical with a poor environmental profile, development of a surface water monitoring program and assessment of a chemical’s potential endocrine disrupting mode of action. Participants worked independently or in groups during breaks, poster socials and tools demonstrations to obtain samples and data from both traditional and alternative sources (e.g., HTS, in silico prediction models, etc.). The approach engaged participants in interactively learning about some of the tools and databases available while deepening their understanding of how HTS can be used in different ERA contexts. Day two of the meeting provided an in-depth look at the ToxCast and Tox21 data sources and a range of complementary tools. Antony Williams, Katie Paul-Friedman, Stacie Flood and Keith Houck of USEPA’s National Center for Computational Toxicology introduced the Computational Toxicology dashboards, ToxCast data analysis pipeline (tcpl) and provided details about the assay platforms employed by ToxCast and Tox21 and their limitations. Michael Hornung of USEPA’s National Health and Environmental Effects Research Laboratory provided an overview of additional HTS assays that had been developed to screen for thyroid-axis endocrine disruptors. Finally, Steven Levine of Monsanto offered perspectives on the importance of performance-based validation of HTS assays and data. Following the plenary presentations, several HTS toxicity databases and tools were introduced and demonstrated at the “Genius Bar.” Tools presented included USEPA’s CompTox Chemistry Dashboard, ToxCast Dashboard, the ECOTOX Knowledgebase and the Sequence Alignment to Predict Across Species Susceptibility (SeqAPASS) tool, as well as USGS’s ToxEval application for comparing ToxCast effect data with environmental monitoring results, the Adverse Outcome Pathway (AOP) wiki, the US Army Corps of Engineer’s AOP-Xplorer tool, and the National Toxicology Program’s Integrated Chemical Environment (ICE) database. In addition to these tools, the AOP framework and dynamic energy budget models were presented as approaches that can aid the extrapolation of HTS data to the individual and population level. Case studies highlighting current applications of HTS data for both individual chemical assessments and the risk-based prioritization and monitoring of complex mixtures found in environmental samples rounded out the plenary presentations at the meeting. Case studies by speakers from the consumer products and chemicals industries highlighted that the willingness of industry to embrace alternative methods is currently limited by the willingness of regulatory authorities to accept those data. Projects and frameworks for incorporating new approach methodologies into chemical assessments in Norway or under US Toxic Substances Control Act legislation showed that regulatory structures are beginning to shift. Several speakers from Europe (Henner Hollert, Inge Werner and Beate Escher) highlighted the EU Solutions Project and several other large scale initiatives that have significantly advanced the use of HTS-based methodologies in environmental screening and monitoring. Parallel efforts were presented by a number of North American Investigators (Alvine Mehinto Dalma Martinović-Weigelt, Steven Corsi and Brett Blackwell). Through various case studies, investigators from both North America and Europe showed that HTS bioassays can account for mixtures of known and unknown chemicals in complex environmental mixtures. Additionally, through mixture modeling it is also possible to use the large database of single chemical data from ToxCast and Tox21 to understand the relative contributions of the known versus unknown chemical fractions to the overall biological activity observed. In the closing round-table discussion, the panel noted that improved integration and coordination between efforts in the EU and North America would likely accelerate if methods were adopted. Investment in HTS infrastructure and methods by developed countries is also needed if developing nations are to benefit from these methods as well. The plenary sessions were complemented by an outstanding series of poster presentations, covering a wide range of topics germane to the use of HTS data in ERA. This included the development of new HTS assays, generation and dissemination of additional HTS datasets, validation of data and analysis approaches, application and development of AOPs, applications for environmental monitoring, high-throughput applications of zebrafish embryo assays and many others. Overall, the meeting highlighted that, while significant barriers to the widespread application of HTS in ERA remain, the science of HTS is maturing rapidly. High-throughput screening data are globally accessible for thousands of chemical structures. Those data are being integrated through chemo- and bioinformatics to support informed approaches to structure-based toxicity prediction, cross-species extrapolation, extrapolation across biological levels of organization and risk-based prioritization. The derivation of quantitative biological effects benchmarks that are clearly anchored to apical outcomes and contextualized in appropriate uncertainty estimates remains the “Holy Grail” for many ERA applications. While the science to support those benchmarks is not yet mature, there are both needs and promising applications that are opening the door to greater use of HTS and slowly shifting regulatory structures toward their consideration and integration. This is expected to be an active area of research and development within the SETAC community for years to come. Major outcomes of the Focused Topic Meeting will be presented during scientific sessions at the SETAC North America 39th Annual Meeting from 4–8 November in Sacramento, California, and the SETAC Europe 29th Annual Meeting from 26–30 May 2019 in Helsinki, Finland. Both the Focused Topic Meeting participants and the broader SETAC membership involved in generating and applying HTS data are invited to submit abstracts and join in the sessions. Additionally, other products related to the meeting are under development and will be made available to the SETAC community. Please stay tuned.